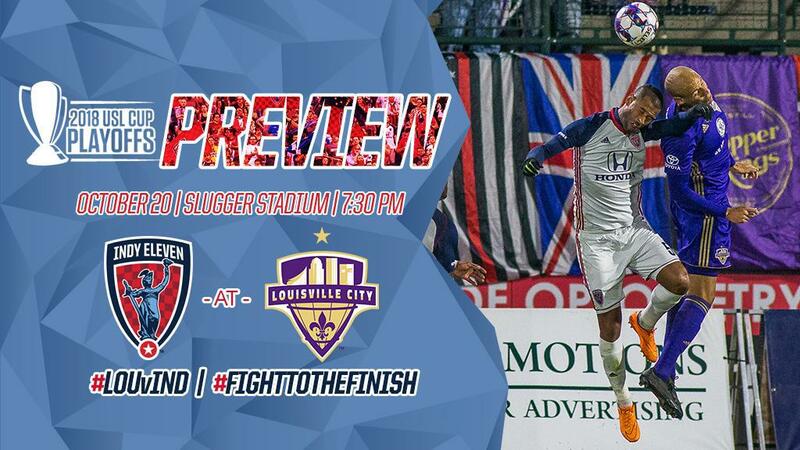 Indy Eleven face Louisville City FC in the first round of the USL Playoffs on October 20 at Louisville Slugger Field in Louisville. The knockout fixture will be the fourth meeting between the rivals in 2018. Each team finished with a 1W-1L-1D record after the conclusion of the three-game Louisville-Indianapolis Proximity Association Football Contest series on October 13, which finished with a 1-0 Louisville City victory in the 2018 USL regular season finale. Indy’s loss sees the “Boys in Blue” finish seventh in the Eastern Conference. The defeat also resulted in the repeat fixture between Louisville and Indianapolis in the playoffs. Louisville now enters the playoffs on a six game win streak after defeating “Indiana’s Team”. Penalties have been the deciding factor in the first three meetings. Indy won the first match, 1-0, on an Ayoze penalty. The second fixture, each side miss a penalty kick opportunity as the match finished a 2-2 draw. The third and most recent fixture was a 1-0 victory for Louisville because of a converted penalty kick by Louisville City Forward Cameron Lancaster. Had each side converted their penalty chances in the second fixture, four of the eight possible goals in the series would’ve been from the spot. In three meetings with Louisville City FC in 2018, Indy Eleven Goalkeeper Owain Fon Williams has recorded 13 saves and one clean sheet, one of which was a penalty save that came in the 2-2 draw on August 5. In his most recent 90 minutes against the Kentucky side, he managed eight saves in a fixture that saw him face nine shots on target. The eight-save performance brings his saves per game average against Louisville to 4.3 saves per game. When 2018 Golden Boot winner Cameron Lancaster struggles to find the back of the net, striking partner Ilija Ilic has picked up some of the slack. Ilic is the second highest goal scorer on Louisville City’s roster. He’s found the back of the net 11 times during the 2018 campaign. The 27-year-old is also the joint assist leader for Louisville City. He’s tied with Midfielder Oscar Jimenez at 10 assists each. The Serbian’s ability to not only score, but to create goals for his teammates makes him a dangerous matchup in the first-round playoff matchup. It will be up to Indy’s backline to slow down the creative forward. The phrase “defense wins championships” reverberates through locker rooms after leaving the mouth of a coach during the pre-game pep talk. Louisville City will need its defense to remain sturdy if they are to lift the championship come the end of the playoffs. The Kentucky based side went undefeated in their last six fixtures, allowing three goals and kept three clean sheets on their way to claiming the last 18 points of the season. They enter the first round of the playoffs coming off one of those shut out performances, which came against Indy Eleven. The “Boys in Blue” enter the first round having scored five goals in their last five matches. Despite the one goal-per-game average, “Indiana’s Team” was shut out in two of those matches and won only one. Indy will need forwards Jack McInerney and Eugene Starikov to perform well during the playoffs, as they did during 2018. The striking pair combined for 16 of Indy’s 45 goals during the 2018 regular season. Additionally, keep an eye out for Forward Soony Saad and Midfielder Dylan Mares, who both scored multiple goals at the start of their respective 2018 seasons with Indy. Don't miss out on your chance to see the "Boys in Blue" on the road. Click here to purchase tickets to this weekend's match in Louisville. Can't make the match? No problem. Watch the match from home on ESPN+ or on MyWNDY-23.